Amazon had one last surprise at its surprise event in Seattle today, and that's the Amazon Echo Spot. Think of it as a cross between the Amazon Echo Dot and Amazon Echo Show. It's tiny with a 2.5-inch screen that lets you watch live from a camera feed and video flash briefings, while also displaying information such as the weather and reminders to pick up your dry cleaning. The Spot is like a smart alarm clock with all the perks of a connected device with a display. It looks like it would fit nicely on a bed-side table or counter top. The Echo Spot has four mics along the top, and a line out so it can plug into any speaker. You can swap out the clock faces, which come in a fun variety. Connected to Alexa, you don't have to physically interact with the Spot but rather utter commands to have it do your bidding. It features second-gen far-field tech, allowing for better pick up of your voice at a distance. 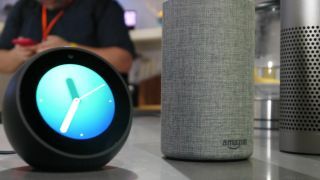 You can also control smart home devices via the Spot, such as locking your doors, adjusting a thermostat or turning on sprinklers, making it a hub along the lines of the new Amazon Echo Plus. The Echo Spot also has the ability to do video calls, which is an awesome feature for such a minuscule device. During an event demo, the Spot was used to display a live feed from a nursery camera, so it acts as a smart cam feed for your home. It can also play video on its screen, such as clips from a late night talk show. The Amazon Echo Spot costs $129.99 and will ship in the US on December 19. It heads to the UK and Germany in 2018. You can pre-order the Echo Spot on Amazon now.